Alpha Centauri continues to be a maddening and elusive subject for study. Two decades of radial velocity work on Centauri A and B have been able to constrain the possibilities — we’ve learned that there are no gas giants larger than Jupiter in orbits within 2 AU of either of the stars. But lower mass planets remain a possibility, and in 2012 we had the announcement of a planet slightly more massive than Earth in a tight orbit around Centauri B. It was an occasion for celebration (see Lee Billings’ essay Alpha Centauri and the New Astronomy for a glimpse of how that moment felt and how it fit into the larger world of exoplanet research). The first team to announce any results from their search was the European team using the HARPS (High Accuracy Radial Velocity Planetary Searcher) spectrometer on the 3.6-meter telescope at the European Southern Observatory in La Silla, Chile. They employed a new data processing technique to extract the 0.5 meter per second signal of α Centauri Bb out of 459 radial velocity measurements they obtained between February 2008 and July 2011. These radial velocity data had a measurement uncertainty of 0.8 meters per second and contained an estimated 1.5 meters per second of natural noise or “jitter” resulting from a range of activity on the surface of α Centauri B modulated by its 38-day period of rotation. A planet with a 3.24 day orbital period was the result of an extremely low-amplitude signal, and subsequent analysis raised doubts about its validity, with Artie Hatzes (Thuringian State Observatory) finding that additional observations were needed to make sure we weren’t seeing noise in the data instead of a planet. Bear in mind that we also have Debra Fischer (Yale University) and team investigating Alpha Centauri Bb at Cerro Tololo Inter-American Observatory (CTIO) in Chile and a team at Mt. John University Observatory in New Zealand. Now comes Brice-Oliver Demory (University of Cambridge), whose team has gone after a different kind of detection, working with the Hubble Space Telescope on a transit search of Centauri B in hopes of finding the signature of the controversial planet. Transits depend upon the alignment of star, planet and observer, so a null result doesn’t demonstrate that the planet doesn’t exist, but using 40 hours of observation, the team was able to rule out a transit of Centauri Bb under the published orbital parameters with a confidence level of 96.6 percent. We explore in the following the possibility that the July 2013 transit pattern is due to stellar variability, instrumental systematics or caused by a background eclipsing binary. We do not find any temperature or HST orbital dependent parameter, nor X/Y spectral drifts to correlate with the transit pattern. The transit candidate duration of 3.8 hours is 2.4 times longer than the HST orbital period, making the transit pattern unlikely to be attributable to HST instrumental systematics. As the detector is consistently saturated during all of our observations, we also find it unlikely that saturation is the origin of the transit signal. We are left with the possibility that this may have been an actual planetary transit with a different orbital period than described in the Centauri Bb discovery paper. Is it a second possible planet around Centauri B, one with an orbital period in the vicinity of 20 days? It will take follow-up photometric observations of an extremely tricky stellar system to tell us more. The paper is Demory et al., “Hubble Space Telescope search for the transit of the Earth-mass exoplanet Alpha Centauri B b,” accepted at Monthly Notices of the Royal Astronomical Society (preprint). For a thorough analysis of the data involved in this work, see Andrew LePage’s essay Has Another Planet Been Found Orbiting Alpha Centauri B? Wouldn’t it be a big coincidence if one of the three closest stars to us just happened to have a planetary orbital plane lined up right for us to observe transits? My impression is that only a very small fraction of stars are expected to be so aligned. I believe Sara Seager proposed to lunch such dedicated satellites which would only observe one star at the time, and would cost 2-5 million. How is this possible? Centauri Bb has a period of 3.24 days, so there’s only a ~52% chance of catching a transit during 40 hours (=1.67 days). I confess I really like the idea! A $2m satellite including/plus launch and operations costs? $2bn would allow long term observations of 1000 selected nearby stars. That seems like an interesting proposition assuming it can be done. 1000 satellites would also offer economies of scale reducing the unit costs substantially. @Holger: the published orbital parameters from radial velocity include the phase information (in the case of Dumusque et al. 2012 they express the orbital phase by giving the time of maximum velocity), which can be used to predict when the transit would occur if the orbit is sufficiently close to edge-on. Consequence is that you don’t have to observe the full duration of the orbit, just the part around the transit window. If the planet is transiting but not when the radial velocity orbit predicts, that suggests that the RV orbital elements are in error. Holger: Hubble initiated the search 20 hours PRIOR to the EXPECTED transit BASED ON RV DATA in hand, and observed continually untill 20 hours AFTER the expected transit! Now, for the Seager- Demory project. It may take only 2 million dollars to build it, but to launch it, and maintain it may take up to ten million dollars A YEAR! Better just to wait for TESS or CHEOPS. A question for Andrew@www.drewexmachina.com: You stated in your lasest post that Spitzer is TOO SENSITIVE to study Alpha CentauriB. Should planets be found transiting there, would JWST ALSO be too sensitive fir follow-up observations of their atmospheres? I believe they mean total time. They would know when to look. Wouldn’t it be most likely that any planets would rotate in the same plain as the two stars? And if so wouldn’t that mean no transits as seen from Earth? As I state in my essay on this topic, Demory at al. said that the two short-wavelength channels of the IRAC cameras on the Spitzer Space Telescope (currently working in a “warm mode” since its liquid helium coolant is now gone) centered on 3.6 and 4.5 um are too sensitive by over a factor of ten to observe Alpha Centauri B to look for transits. As for JWST spectroscopy, I’ve had to do some digging but there does not seem to be a definitive answer yet on upper limits of star brightness for spectral observations. While the JWST science community is still examining the issue of observing bright stars specifically for getting data for planetary transits (and juggling a bunch of different observation modes, available apertures, engineering limitations, etc. ), I definitely have the impression that getting spectral observations of Alpha Centauri B will be problematic, at best, and will likely not be possible. This is not too surprising since JWST and its instruments are optimized to look at VERY dim objects and Alpha Centauri B is one of the brightest stars in the sky. Regarding small satellites, it seems to me that you could build and launch some really cheap ones by modifying a regular, mass-produced smartphone. Rip out the battery and screen, replace them by solar cells. Add some microthrusters (http://newsoffice.mit.edu/2012/microthrusters-could-propel-small-satellites-0817), and/or deployable lightsail wings. Launch costs currently are $5000-$15000 / kg, that could be less than $1000 for a each phone/spacecraftPhone form factor is very suitable for stacking. The camera has many uses, although probably not suitable for serious astronomical observations. Point being, maybe we can have satellites for $2000, rather than $2m, with a bit of improvisation…. I second Andrew_W’s question: do we not have good parameters for the orbital plane of the 2 stars Alpha Centauri A and B ? If so, would not that plane be the most likely plane for planets around B? And if we know the plane, we would know not only M sin i, but also M (ie “i” would be known). Knowing the plane would also let one calculate the maximum distance from B at which one could see transits (beyond which distance the planet would not cast a shadow). Knowing the plane we could also calculate probability of transit: ie if we’re seeing the co-orbit nearly face on, we’d be very unlikely to see transits (or much RV signal either). Thanks for the update, Andrew. This is all VERY hypothetical, of course, but; should this transit signal be REAL, the OTHER OPTION would be to build a STARSHADE for JWST and observe any and all planets in NON_TRANSIT MODE! This “New Worlds Observer” program should be put at the TOP of NASA’s priority list if ANY planet is confirmed by ANY means! 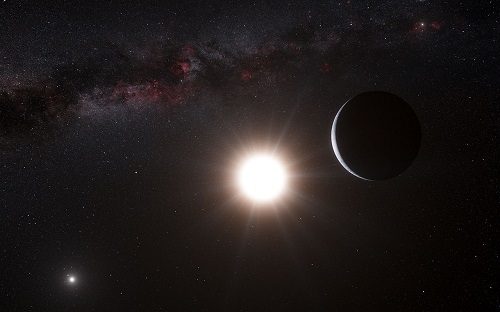 At this time, there is no evidence to suggest that the orbital plane of extrasolar planets in widely-spaced binary star systems like Alpha Centauri are necessarily aligned with the orbital plane of the stars. In fact, there are dynamical arguments to be made that even if such planets do start off with coplanar orbits, strong interactions with the stars might change the orbital parameters of the planets from any initial values including their inclination. Without any information to constrain the inclination of an extrasolar planet’s orbit with respect to the plane of the sky, it is still possible to calculate the odds of a randomly oriented orbit will produce observable transits if the size of the star and the semimajor axis of the planet’s orbit are known. In the case of Alpha Centauri Bb, that works out to be 9.5%. For a planet with an Earth-like orbit around a Sun-like star, the odds are about 0.5%. Their not that widely spaced; B swings between 11.4 and 36.0 AUs from A, so at their closest they’re as close as Saturn is from the Sun. In our solar system all of the planets are inclined at 6 degrees or less to the Suns equator, A Cent B is given as having an inclination of 79 degrees, is that to our line of sight? If so any planets in the system would need to be inclined by nearly that angle to the plane of the binaries to cause transits. So to me transits are very unlikely, though that line of reasoning is just common sense (extrapolating from the accepted wisdom, and I’m always first in line to knock common sense). On the subject of coplanarity of the Alpha Centauri system, there is evidence that the rotation axis of Alpha Centauri B is substantially misaligned with respect to the binary orbit. See this paper for details. What that implies for the orbital orientation of any planets orbiting the star is another question, but I wouldn’t particularly expect the planets to be aligned with the equator of the star in this case. Given that Alpha Centauri B is substantially misaligned with the orbital plane of A and B, the Kozai effect would have played an important role in both planetary formation and their subsequent evolution i.e. all bodies would have had a strong tendency to go from a circular orbit aligned with B’s equator to an elliptical orbit aligned with the plane of the A-B system and back again. Astronomers define widely spaced binaries as pairs of stars whose separation is large enough so that they do not affect the evolution of each other in any appreciable way. Alpha Centauri A and B meet this definition which is why, for example, the rotational axis of Alpha Centuari B is not aligned with it orbital plane with A in the paper cited by “andy” above. The logic in your example of the coplanarity of the planets in our solar system and its application to stellar binaries is flawed. First of all, star systems form by a different mechanism than planetary systems and there is no expectation that the “invariant planes” of widely separated binaries are aligned. In fact there is a mountain of evidence that they do not (e.g. the paper “andy” cites). Secondly, not all planetary systems are coplanar. They might start out that way but about half of them subsequently evolve by a number of different dynamical mechanisms so that they are no longer planar. There are numerous examples of the orbital planes of extrasolar planets not being aligned with the equators of the stars they orbit and statistical analyses of Kepler data are best explained by only about half of extrasolar planetary systems being coplanar. Unfortunately, there just is not any evidence to support your belief that the orbits of the planets of widely spaced binaries like Alpha Centauri must be aligned with the plane of the stars’ orbits. I was thinking about the dynamic effects on planets that might occur in the Alpha Centauri system using our system’s terrestrial planets and Jupiter . If your regard Jupiter as a stand in for Alpha Centauri A and take the plain between the midpoints of the sun and Jupiter (this is not the plain of the ecliptic but it’s close), then the sun has an obliquity of approximately 7 deg to what I will call the plain of the solar system (why this is is a mystery). You then have a similar set up to Alpha Centauri B’s obliquity to the plain of the Alpha Centauri system only more muted. It is interesting that all the inner planets except one, align fairly closely with the plain of the solar system. The only exception is Mercury, which is aligned with the sun’s equator. Apparently, the tidal effects from the sun’s equatorial bulge were sufficiently strong to align Mercury with it. Now to the question: if the sun tilted Mercury’s orbit 7 degrees from the plain which all the other planets are on, then could the Kozai effect have given it its orbital eccentricity or given it enough eccentricity that as the planet spun down through tidal drag it fell into its current lock in 2 to 3 orbit to spin resonance? Thanks Andrew LePage: I have learned a lot. A related question: let’s say we are observing 2 stars: for one we’re seeing one of it’s poles, for the other we’re observing its equator. I realize we cannot resolve the actual disc of but a few stars, but given the spectrographic detail we can see for bright stars, how strange it is that we cannot tell apart those situations? I have also read that the magnetic field is quite different above the pole versus the equator and magnetic fields lead to splitting of lines in spectra: yet AFAIK we have no idea we’re looking at it pole-on or equator-on ?? ?Obviously, if we could tell, we could focus transit search away from stars we’re seeing pole-on. There are a variety of methods available for determining the the orientation of a star’s rotational axis with respect to the plane of the sky. Without getting into the details of them all or the merits of what you propose, the underlying problem is that these methods are very time consuming and have great difficulty providing any usable results for slowly rotating stars of low apparent brightness that do not display a lot of surface activity (i.e. the overwhelming majority of stars in the sky). It is actually much easier to look for transit events. Besides, as has been mentioned earlier, the orbital planes of extrasolar planets do not always line up with the equator of the stars they orbit. If, for example, the results of the recent paper “andy” cites by Xavier Dumusque are correct and the inclination of the rotational axis of Alpha Centauri B is ~45 degrees, we would have never bothered to have looked for transits if we were to use the criterion you propose. As a result, we would have never observed it using HST and would have never detected the transit-like event discussed here uncovering evidence of a potential second planet orbiting Alpha Centauri B! Even if measuring the orientation of the rotational axis of a star were a lot easier, for now it makes a lot more sense to search as many stars as possible for transiting planets until we have a much better understanding of the connection between the relative orientation of extrasolar planets’ orbits with respect to the equator of the stars they orbit.